Glowing gaseous streamers of red, white, and blue, as well as green and pink, illuminate the heavens like Fourth of July fireworks. The colorful streamers that float across the sky in this photo taken by NASA's Hubble Space Telescope were created by the universe's biggest firecracker, the titanic supernova explosion of a massive star. The light from the exploding star reached Earth 320 years ago, nearly a century before our United States celebrated its birth with a bang. The dead star's shredded remains are called Cassiopeia A, or "Cas A" for short. 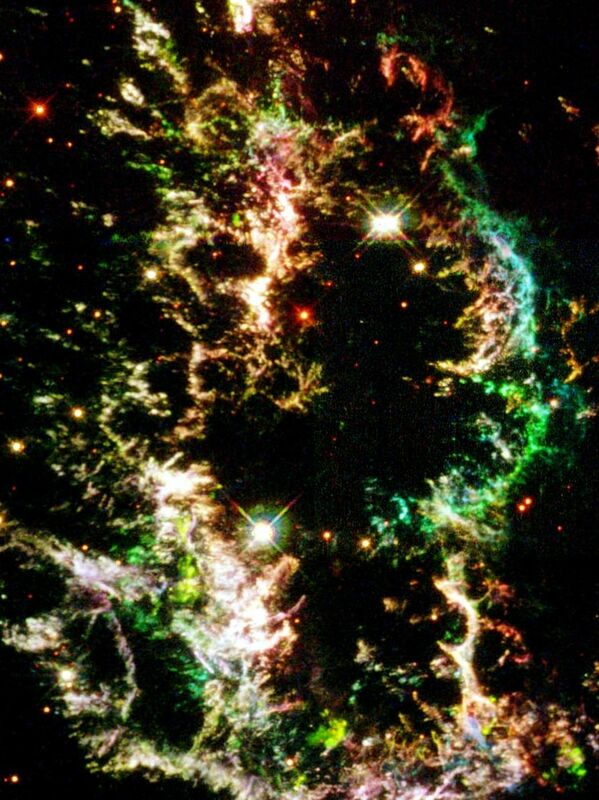 Cas A is the youngest known supernova remnant in our Milky Way Galaxy and resides 10,000 light-years away in the constellation Cassiopeia, so the star actually blew up 10,000 years before the light reached Earth in the late 1600s.